D&D Storage and Moving offers protected, climate controlled furniture storage options to meet both short term and long term furniture storage needs. 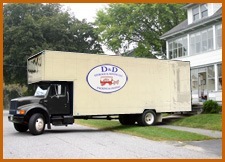 D&D moving crews are happy to come to your home or office at your convenience and pick up the items you’d like to place in storage. When you’re ready to have items that have been stored away returned to you, simply give us a call. We’ll deliver and place the furniture wherever you’d like. Each customer is given personal storage containers that are all their own. Your belongings will never share a container with another customer. Our storage units are clean and extremely sturdy. All of your furniture that is placed into Cincinnati, Ohio storage will be properly padded to ensure its safety prior to being placed into your personal container. Smaller items can be packed into boxes prior to our arrival or we will be happy to have one of our professional packing experts pack them for you. At any time, if you wish to go through the items that you’ve placed in storage, give us a call. We’ll be happy to unpack your furniture and belongings and you can retrieve specific items or arranged to have them delivered to you at your convenience. Afterwards we will re-pad the remaining items and place them back into your personal storage container(s) for you. Our fees are very reasonable and can be billed monthly, quarterly, semi-annually or annually. We accept all major credit cards and payments can be made quickly and easily over the phone. Give the D&D family a call today to get started!